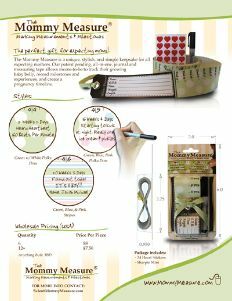 The Mommy Measure is a unique, stylish, and simple keepsake for all expecting mothers. Our patent pending journal and measuring tape allows moms-to-be to track their growing baby belly, record milestones and experiences, and create a pregnancy timeline. ~ 61 inch pregnancy growth chart and journal made with a lightweight, tear proof, PVC free, & more environmentally friendly material.